I’m back in the office, at least part-time for the next few weeks, and going over lots of good stuff. Besides beginning work on the next quarterly forecast – to be released in late August – I’m going to be working a lot on different industry clusters, plus our office is taking a fresh look at Oregon’s personal income trends. The following is a short exhibit from where these subjects intersect. The first cluster I am working more in-depth on is High Technology, which is more than just semiconductors when looking at the broader cluster, and should have a short report out in about a week or so. Fun Fact (really a question): Over the Great Recession do you think High Technology has outperformed or underperformed the overall economy, at least in terms of employment? What about over the past decade? Answers plus a lot more will be in the report. For now, I just want to focus on two industries and not the entire related clusters: Computer and Electronic Product Manufacturing (NAICS 334) and Wood Products (NAICS 321 and 11331). In Oregon in recent decades we have seen the decline of the wood products industry (mills and logging) and the rise of semiconductors. How do these industries influence the state’s average wage? It turns out that in terms of the arithmetic impact on the average wage the industries have effectively offset each other. 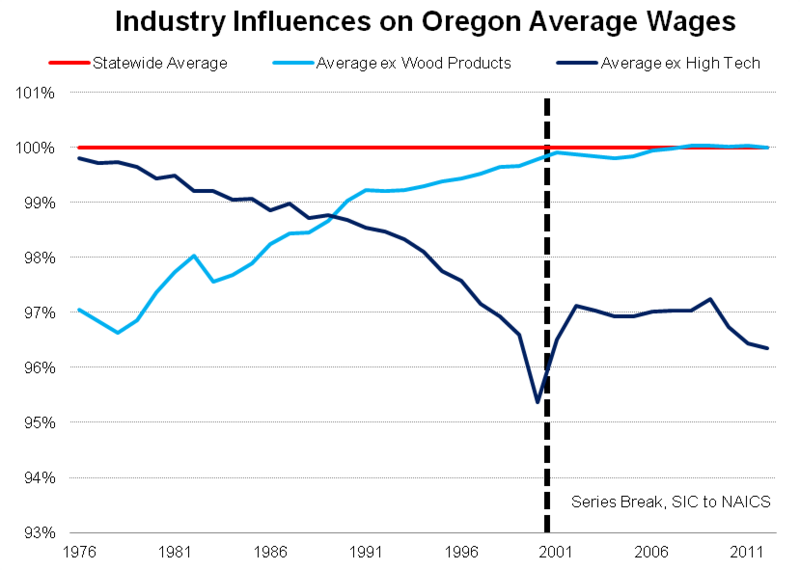 In the late 1970s, Oregon had approximately 80,000 Lumber and Wood Products employees (SIC 24) that had wages about 35% above the state average. These jobs raised the statewide average by about 3%. In recent decades the outright decline in these types of jobs (both due to land/logging restrictions and industry productivity) and the fact that their real wages have eroded (today’s workers in the industry receive the state average in pay) means that the industry no longer has a significant arithmetic impact on the statewide average. This is shown in the light blue line above going from 97% to 100%. Computer and Electronic Products have essentially the mirror image pattern. In the late 1970s there were approximately 20,000 workers in the myriad SIC codes that comprise today’s NAICS 334 and the wages were approximately the statewide average at that time. Over the past few decades both the number of these workers increased and the industry’s average wage grew faster than other industries. The end result being that today’s Computer and Electronic Product workers have effectively the same impact on the statewide average wage that a generation ago Lumber and Wood Products employees had. This is just one interesting tidbit you can find when examining industry trends and structural changes over time. Of course these are simple calculations that do not take into account any further dynamic economic impacts and associated industries or supply chains. Additionally even as these larger trends are somewhat offsetting, they certainly are not offsetting from a geographical perspective within the state. The decline of the timber-related jobs, as detailed in-depth previously, is concentrated in the state’s Southern and South Coast counties, while the Computer and Electronic Product jobs are concentrated in the Portland MSA (about 88% for 2012). For those interested in the specifics of the graph: Wood Products consists of SIC 24 from 1976 through 2000 and NAICS 321 plus NAICS 11331 (logging) for 2001-2012, from the QCEW data. High Tech consists of NAICS 334 from 2001-2012 and the following SIC codes for 1976-2000 – 3429, 3495, 3571, 3577, 3674, 3677, 3672, 3661, 3679, 3585, 3599, 3812, 3823, 3825, 3826, 3829, 3842, and 3845.